Stunning expansive sea views!! House looks down on the fishing boats unloading. Wonderful relaxing and spacious 'feel' to this holiday house. Feedback from all who have stayed has been very positive. The house is spacious and well appointed with all the essentials provided - all linen. There is a BBQ with plenty of outdoor seating. Everything is within walking distance with a short drive to the Lighthouse with fabulous wildlife, on a recent trip we saw yellow eyed penguins and many sea lions, its just stunning and reasonably rare I would think to see so much so handy. A short walk from the house is a gorgeous beach The Little Kaik - along road beside the Marae. Not a swimming beach but fun for fossicking, sometimes seals sun themselves there. Fleurs Restaurant is renown and has along with the Moeraki Tavern won awards and accolades. Great supermarket and take-aways a few minutes north on the main road at Hampden. Check re parking with your boat as there isn't a lot of turning space, however recently a party stayed and said they had 2 boats and several vehicles so would depend on size. There are books and toys for children. Re charge your batteries, laze on the sofas or deck with a stack of books and magazines or pull up to the log fire. The conservatory is great to watch the action or views especially if the weather turns cold. Children will love the rock pools out from the Community Hall or gather some mussels! Escape the cares of the world and book for a group of friends, family or a quiet get-away for two. Take time out and recharge! Arrival time 3pm, departure 10am - ask if change needed. Happy to discuss the possibility of pets staying. Smoking is outside only and we thankyou for your consideration around this. It is very important there is close supervision with small children in that the front of the house is an unknown area to us, it will slope down quickly with a lot of greenery and the ground might crumble away. We have had a lot of children staying and it hasn't been an issue as there is plenty of area for playing. Moeraki Boulders attractions handy, also Oamaru's historic area + Palmerston. The home was very comfortable and in a great location. The views are wonderful (I wish I had a pair of binoculars). The house is easy walking distance to the tavern. We had a day of rain and were very comfortable staying in and doing a puzzle. We really enjoyed our stay! We arrived to a clean and ready house. Beds where comfortable and we all had a wonderful two days of fantastic views and great nights sleep. Enjoyed watching the rabbits too. 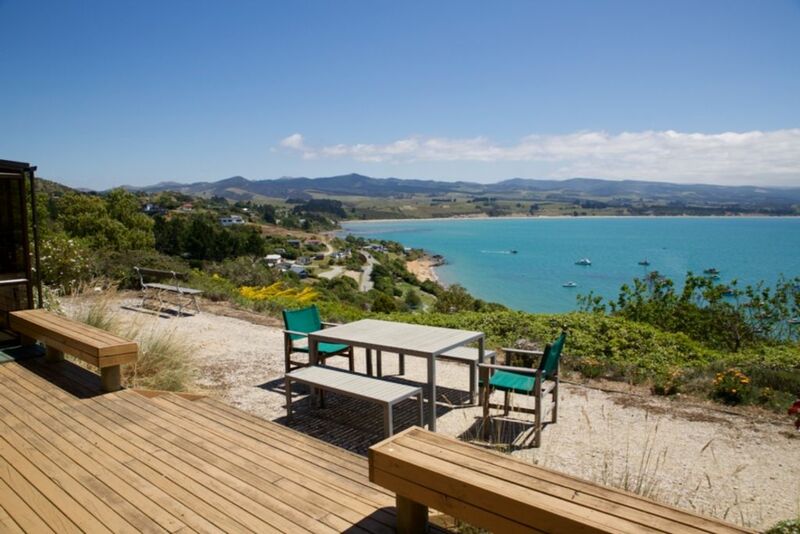 This great kiwi Bach has everything you need for a comfortable and relaxing holiday in a great location. The views are fantastic, regardless of the weather and not having to take linen or clean is a bonus. We would happily stay here again. It was a lovely comfortable place to stay. I would return. Great location. Plenty to do in the area. Not so lucky with the weather, but it does not matter. And of course the view wonderful in all seasons. Very nice accommodation. Views great! Comfortable and generally well set up. We enjoyed our stay very much but... there should be a working dishwasher, the smooth-top cook top was not reliable to use, and tv was difficult to work. The driveway...needs to be easier to manage. I have a grunty car but struggled every time to get up it. Thank you, I would use it again.